Powerbots long awaited Tithe Farm script. Automatically calculates if you'll have erough time to do 16, 12 or 8. Plants, waters, harvests, deposits & restocks. Optimally selects watering cans to allow for animation cancellation for extra speed. All 3 seed types included. Refilling watering cans manually at a bucked OR Humidify. World hopping if someone crashes your spot & for antiban (open area, people might talk to you). 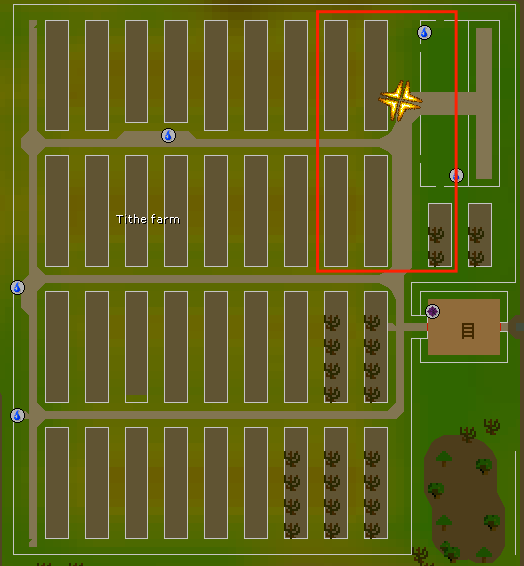 In order to play this minigame, players must have 100% favour with the Hosidius House in Great Kourend. Three types of seeds can be found on the table near Farmer Gricoller, each requiring a specific Farming level. Players can only take one type of seed, and boosts can be used, but boosted levels must be maintained when planting seeds. You must also have already told Gricoller that you are an expert before entering the mini game so that you can freely enter the door. -I'd recommend 8+ watering cans to enable enough doses of water for all the plants and enough variation for the optimal speed during animation cancelling. -I'd also recommend some stamina or energy potions if your agility level/weight isn't very good. -With your watering cans, spade, seed dibber and seeds, it's best to start at the water but on the far Northeast side. -It will operate on the highlighted patches so starting elsewhere will not work. -Once you start the script you may notice it checks the magic tab and adjusts the zoom level. This is intended. Q - It's just standing there doing nothing by the door? A - Try to start near the water barrel, if this is during a mid run please tell me what the Current Task & Debugging tasks show. Q - My plants are dying, thought this was supposed to calculate when it can't complete a full 16? A - If it is the first 2 - 4 that are dying then it's down to speed, let me know and I'll try to adjust things. This may also be based on the speed of your pc so be aware I may look into that further. A - Alternatively if it is a random plant in the middle of the patches, please take a screenshot so I can see what plant it is but it may just be a simple miss click. As long as you deposit 75 fruits you still get your full bonus. Q - What anti-patterns have you implemented? A - There isn't a designated anti-pattern task that I've implemented into this. However all of the clicks are randomised as per where they actually click on the items/objects etc. A - Waits are all conditional meaning it act's in a more human like reactive way so as it'll wait till something is ready/done then act. A - Pre-action hovering, when it's doing an animation for example it'll get the item ready and hover the mouse over where it then needs to be next for example whilst watering plant 2, it'll have selected a new watering can and hover over plot 4 ready to water that next. A - The basis of the script is to make it human like in it's actions and responses. Also will hop worlds if there is another player around (given that you have nothing planted) so they cannot talk to you etc. Q - It's just seems really slow and laggy? A - This is likely to be your pc, with the high reaction speeds necessary I use multi-threaded methods which can utilise much more computing power/resource than a regular script. Q - I've heard you record data? A - I do record data from runs. However nothing pertaining to your accounts identity. For this script it is stuff like runtime, xp gained, levels gained, efficiency, how many times you've hopped worlds etc. There is also some data recorded on about your pc's hardware for example operating system. I have a mac so this has been tested on a mac and mac only thus is useful if I can see what you're using. Please all remember that this is not perfect and there is only so much I can test on my own. When reporting bugs please ensure that you give as much detail as possible. Trying to get it to work rn, will let ya know. I understand, Yeah. Rn the issue is world hopping. Hops for no reason before any harvest, despite no players around etc. Sorted it! I made the condition always return true while I was testing it and forgot to change! Made an update which should hopefully stop that happening. Made an update to speed up the looping, it should no longer activate basic task list unnecessarily thus making it slower. Also updated the calculations as to when it does 12 vs 16 plots. Thanks for your work gonna get on and try it again now. Also, mouse movements look very sketchy on harvesting. They're fine for planting, but it like 'teleports' to the harvest click. Same speeds and methods used for all of them, because it doesn’t go back to the inventory there is less screen distance to travel thus is just a quick straight line.